Two white sheets or pieces of fabric approx. 40 inches in width and the length of the child, measured from head to toe. Brooches, badges or safety pins. Sandals or pumps with ribbons attached at the side so when fastened up the leg, the criss-cross effect gives the appearance of Greek sandals. Sometimes women wore flowers in their hair as a head-dress. 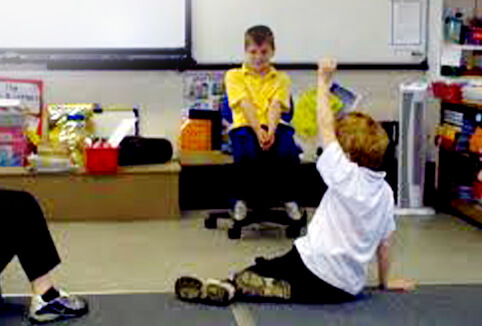 Hold one sheet up against the person and fold the top down to shoulder height. Repeat for the back with the second sheet. Pin both together at the shoulder with safety pins or brooches, then tie around the waist with the belt or rope. As above, except only pinning the sheets together at one shoulder. Fold down at the unpinned side. In Ancient Greece, the older you were, the longer your tunic was. You can decorate the edges with gold writing or cut a stencil out to decorate with a swirl. Heavy card stock, 8.5×11, enough for a sheet per student. First, determine the distance between the eyes. The easiest way to do this is to close your eyes and very gently place two fingers (thumb and second finger seem to work best) on your eyes. Open your eyes and transfer the distance to the paper and mark the eyes with dots. The eyes should be about a third of the way down the paper, and centred. Once you have marked the location of the eyes, draw the eyes around your dots. Make them about as big as, or a little bigger than, your own eyes.Draw the shape of a head around the eyes. The head should be as big as the paper, especially at the sides. (Otherwise, among other things, the elastic will not be long enough.) Depending on the character you have in mind, you can make the head basically oval or a more fanciful shape. Remember, though, that it should use most of the paper, or your own face will show through. Once the mask has been decorated, cut it out. Teacher may have to help cut out the eyes. Punch holes on the sides, around one inch below the eyes. Carefully tie one end of a 14″ piece of elastic to each hole. If the elastic is too loose, re-tie one side. 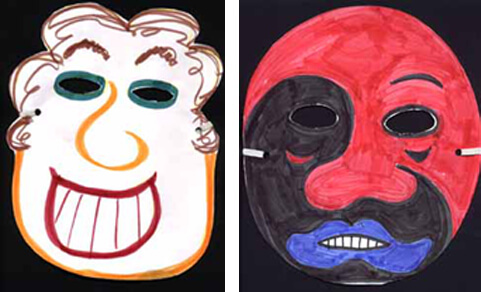 Your mask is ready to wear. 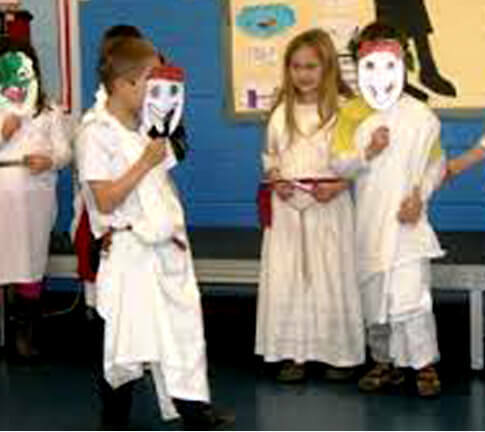 The children assume the role of a Greek character and are questioned by the remainder of the class also in role. The gods on Mount Olympus asking Zeus why he made Pandora’s Box. Why did Pandora open the box, when she was asked not to? The slaves asking King Minos what is going to happen to them inside the Labyrinth? The land of Greece is made up of mainland Greece and the numerous islands scattered throughout the Aegean and Adriatic Seas. It is a mountainous country with hot dry summers and rain only in winter. The early Greek settlements developed as small independent communities cut off from each other by the mountains and often competing for the best land, because the fertile arable soil is in short supply. Each of the city-states which developed out of these communities had a strong individual identity, and citizens were very loyal to their home state and to its patron deity. This miscellaneous collection of city-states sometimes joined together for mutual defence and did so most successfully against the Persians. 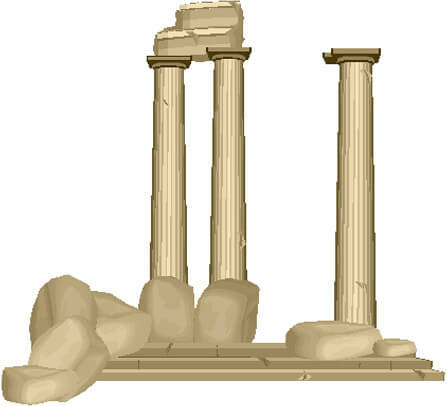 The Greeks produced a glorious culture which has had a profound effect on western civilization through succeeding centuries, reverberating right down to the present day. They scaled the heights in literature, the visual and dramatic arts, in philosophy and politics, in sport, and in many other aspects of human life. 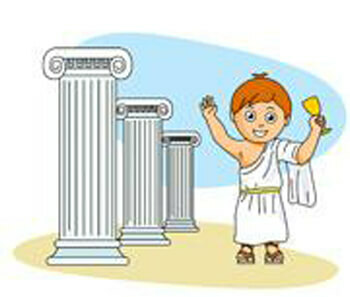 Greek civilization reached its peak in Athens in the fifth century B.C.